Well her she is after 3 years in a barn. I always dreamed of a barn find. A 928 isnt exactly what I dreamed about but I will take it. 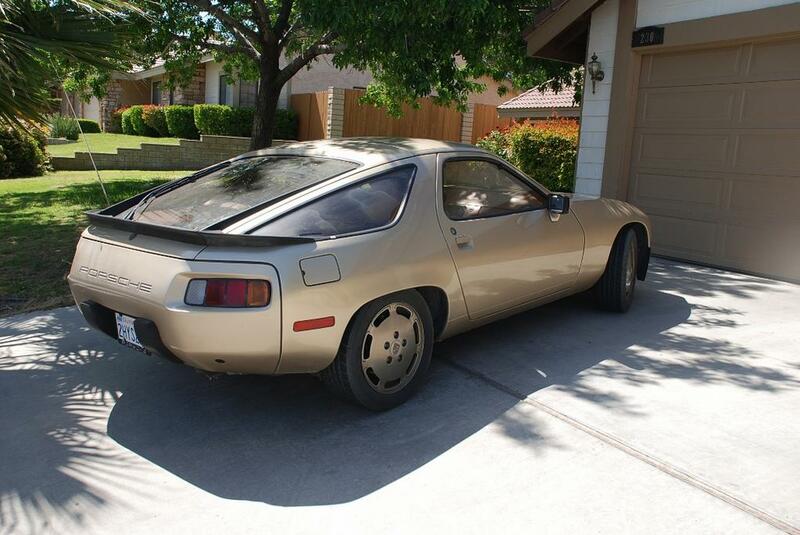 The 928 motor runs like its brand new. The Clutch feels like a GT3 clutch but almost heavier. I purposely drove my C2S out there to get a direct contrast to the 2 cars. The first thing I forgot was the 5 speed pattern of Porsche. I took off in 2nd gear. And the Key is in the wrong spot. I couldnt get in to a position to see what the handling was like but the car is HEAVY. It feels like a well....... a Viper, big heavy slow feeling. The seats are all power and all work, The mirrors are power and all work. The radio is a Blaupunk and works. The ONLY thing is the windows or AC, a bad combination in the desert. But I think I can recharge the AC I think. It started working a TINY bit about 20 minutes into the ride. 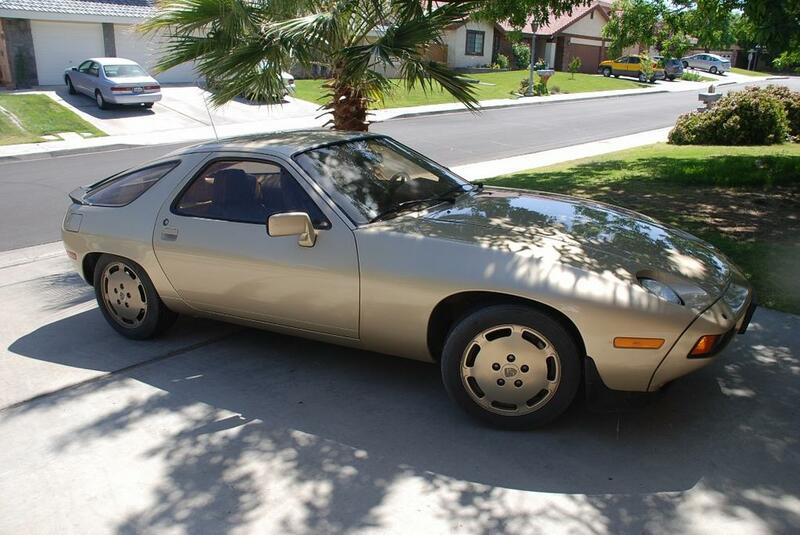 OVERALL, the car is light years away from a C2S PDK, but I couldnt quit thinking if Porsche had continued to build these things, the current 928 would be ONE AMAZING car. It only has 220 HP but it feels MUCH more Powerful and is a WONDERFUL example of Porsche engineering from 30 years ago. TRULY ahead of its time and I cant WAIT to get to put some miles on this wondrous motor. When I rolled up and I saw the C2S in the garage the 928 reminded me how pretty the 911 is, but the 928 held its own in MY driveway. Two of the prettiest cars in Porsche history. It doesnt look like much now but these pics arent good, but let me have some time with some paint restoring system and it will look like a show winner. Looks like you got a winner there! Would love to see an interior shot. The interior design is specific to the Weissach. I'm glad you are enjoying you new Porsche. Nice unmarked original wheels too. Do NOT use wheel cleaner on them - they're anodised, and wheel cleaner will damage them. Factory advice is to use regular soap and water, then rub with vaseline and a soft cloth (yes, vaseline). Nice initial impressions.. the 928 full leather interior is nice to have, although high maintenance. Looks good ! do NOT use ANY wheel cleaners on those platinum anodized rims. It is often better if the original owners never waxed polished or had their car detailed because it gives you far more paint to deal with. You do realize that your newish "911" is more like the 928 than it is a 993 or earlier 911. Including size, weight, rear suspension, interior room,mode of cooling, wet sump.....I doubt that the 928 weighs much over 200 lbs more than your 997. That is a beautiful car, nice find! I have always loved this special edition. Did the luggage come with it? More pics once polished, please. Welcome to the club, OG! Looks like you found a good survivor, she should clean up quite nicely. As to your "heavy" comments, I've found driving mine around town to be work. The controls are heavy, the car feels heavy, and you start to wonder whether or not you're really driving a Porsche. My E36M3 was a much more pleasurable car to drive around town, just pure joy as a daily driver. Then you get it out of the city, get your speed up, find some high speed twisties and you begin to understand. This is a car that comes alive at about 80mph, and it gets better from there. What previously felt heavy now feels solid and secure, like it's on rails. About this time you'll find yourself with one huge grin on your face and you'll laugh out loud. Have fun! What a great find. Congrats. Thanks guys, interior pics to come. Thanks for the tip on the wheels. I can hardly wait to get working on the car. There is not a whole lot to do but compared to a new 911 there is a TON to do. The interior needs to be cleaned and vacuumed. The carpets need to be shampooed. JWise you hit the nail on the head there, it just feels heavy. Like some one said its probably not 200 lbs more than the 997. I was imagining what it felt live to drive brand new! Must of been cool. Any tips on getting the rubber on the spoiler black again? I am amazed at the smoothness of the motor and how much power the motor has given its low HP ratings. It sure feels like MUCH more than 220hp! You dont get your head ripped back in the seat like the 911 but you KNOW you are GOING and QUICK! At these kind of prices I could see getting another one. Jim, I was thinking the EXACT same thing when I read this. In fact I had a job interview on Friday (yesterday and I thought it went very well) and at the end we got to talking about cars and one of the managers said how he thought the current (and previous one if not two) 911's were far more like a 928 than they were like the original 911 and I told him that was an EXCELLENT and quite correct observation. Of course the one things 911's DON'T have and NEVER WILL have is the PURE Porsche development history! 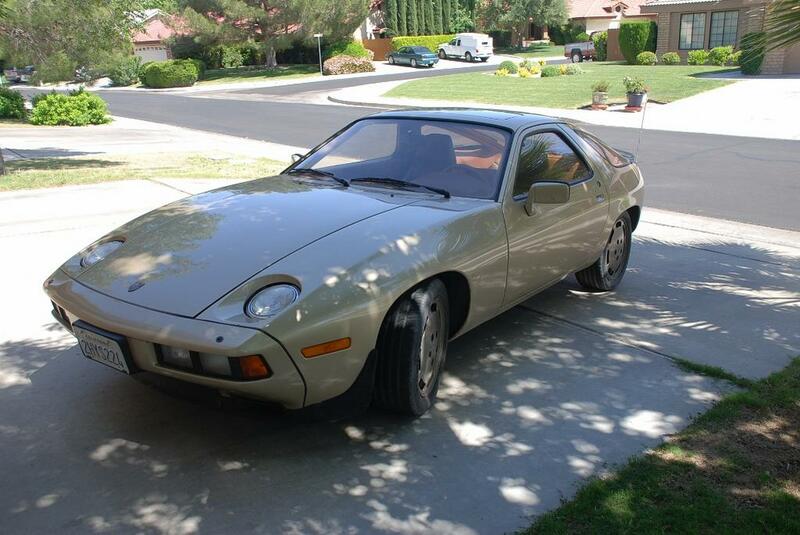 The 928 was conceived and built from scratch by Porsche FOR Porsche. The 911 has its roots squarely in the 356 and it is an offspring of the VW Beetle! The 928 is more of a TRUE PORSCHE than ANY OTHER Porsche (save most of the race cars of course and I suppose the CGT as well). Oldguy, you got a winner there! Enjoy it! 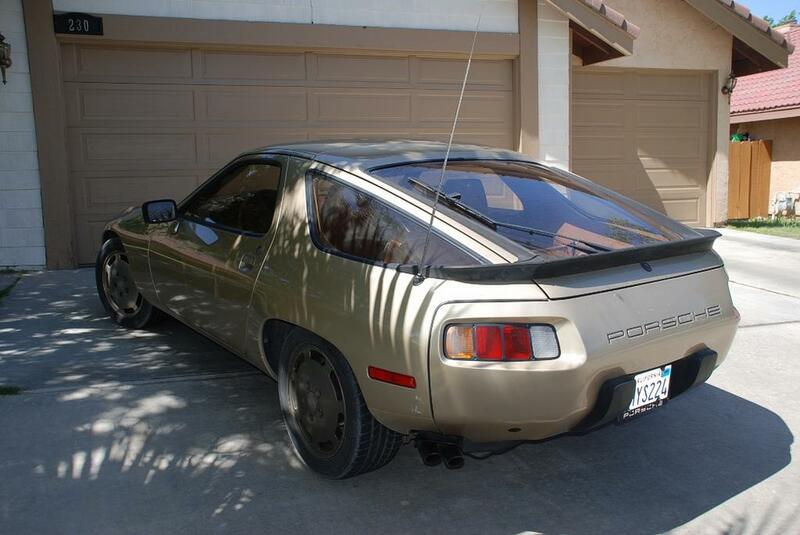 BTW, if Porsche had continued to develop the 928 it would probably have nearly 600HP today and cost between $150k and $250k! OUCH! When the PanAm was in early development and folks started speculating on the 2 door version (928 successor they would often say) the speculation was the car would be set to go head to head with the 599! CHA-CHING! Very nice. Your fuel hoses in the engine bay are likely rotten and need to be changed as soon as possible. I'm doing this right now to my 82 Auto. The second most important thing you need to do is go through the entire car and scrub/replace/TIGHTEN all of your ground terminals. I just went through hell troubleshooting a no-start condition that was finally cured by tightening the most important ground terminal in the entire system (beside the battery ground), the fuel injector ECU ground, which is hidden under the auxiliary (smog) air pump. WD40 works great on old electrical contacts. I saturate everything in WD40 every few weeks. OG - the best I've found for the rear spoiler and front air dam is a product called "Black Again"
Brings the color back without being too shiny IMHO, and it has UV protection built in. Works good on the window trim, too. The heavyness is something you can reduce a bit if you choose to. But its always there.